What is mobile ad mediation? Ad mediation has become an increasingly popular tool among app developers over the past couple of years – and for good reason. Consumer willingness to pay for apps remains low, while mobile engagement is on the rise, creating an environment ripe for advertisers. Indeed, mobile advertising spend has seen exponential growth in recent years and is only projected to increase further. This demand has flooded the marketplace with ad networks and exchanges, creating a fragmented ecosystem which is difficult for developers to navigate. 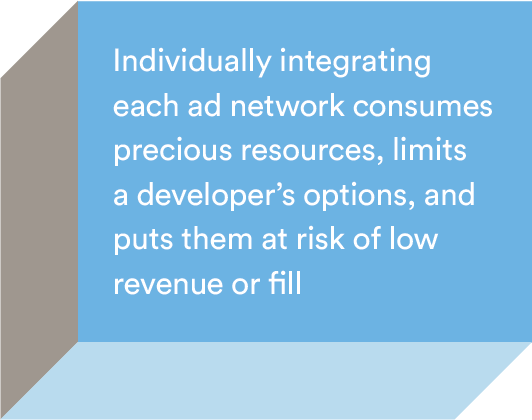 Individually integrating each ad network consumes precious resources, limits a developer’s options, and puts them at risk of low revenue or fill if the selected networks cannot scale with the app or offer the performance the developer was seeking – not to mention that the fact the demand from each network isn’t optimized. Mobile ad mediation entered the marketplace to address that concern. Ad network mediation allows developers to access and manage a wide array of demand sources, while maintaining direct contractual and financial relationships with the partner ad networks to ensure complete transparency. Mobile ad mediation also simplifies the integration and maintenance of multiple ad networks through a unified SDK, and provides a centralized platform to analyze and adjust one’s strategy post-integration. For example, if a strategy change calls for new geo-targeting, or a high-DAU app wants to integrate additional formats to further monetize their users, ad mediation enables the developer to easily add or remove networks, without a deep and time-consuming dive into the code. But while the benefits of ad mediation are clear, selecting an appropriate provider is still an extremely important task. We’ve put a list of the top things to consider when selecting a potential partner. The first thing to look at when reviewing a potential mobile ad mediation partner, is the breadth and quality of their demand sources. How many partners do they work with? Do these demand partners cover all of the ad formats and geos that you are interested in? Are they industry-recognized and have a track record of success? After all, consolidation of fragmented demand into a single, unified platform is the primary selling point of ad network mediation. You want to ensure from the get-go that your partner can provide you with wide array of demand options, so you’ll be covered no matter how your ad strategy may shift in the future. To ensure that you maximize ad revenue, you should work with an ad network mediation partner that will optimize your various demand streams to serve you with the highest-paying ads. 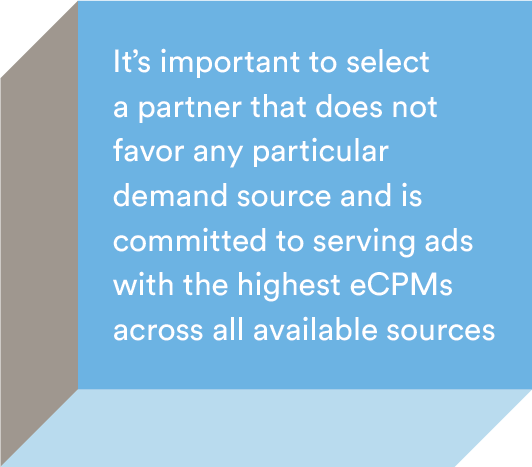 It’s important to select a partner that does not favor any particular demand source (especially their own) and is committed to serving ads with the highest eCPMs across all available sources. Be sure to ask how the provider prioritizes demand – do they offer optimization? If so, how does their algorithm work? If a traditional waterfall model is employed, you may risk cycling through a number of potentially lesser-paying ads before moving on to the next available network. For example, Fyber employs a predictive algorithm that estimates the performance of each ad on a campaign-level, rather the demand source-level, by using statistical modeling based on user data, ad impressions, ad network revenue, and real-time network performance. Creating a great app is challenging; integrating your mobile ad mediation provider shouldn’t be. Ask your prospective partner how their integration process works, as well as how they manage technical updates from mediated partners. 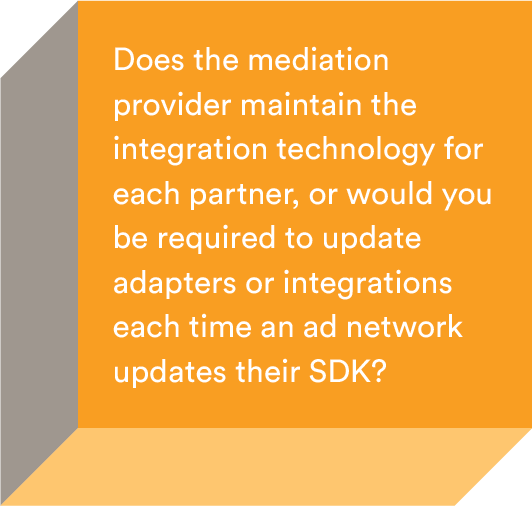 Does the mobile ad mediation provider maintain the integration technology for each partner, or would you be required to update adapters or integrations each time an ad network updates their SDK? Fyber offers mediation bundles that allow developers to integrate only the networks that they want, minimizing unnecessary files that weigh down the app. Each bundle includes all the components developers need for integration, including the adapter, the ad network SDK, and its associated libraries. This approach not only minimizes integration time, but also improves quality by eliminating the chance of version mismatch. Not only are all bundles thoroughly tested and certified by Fyber’s internal team of engineers, we also provide ongoing adapter maintenance to ensure the stability and reliability of our clients’ integrations, saving precious engineering time and resources. One of the primary hassles of not working with a mediation partner is the stress of having to consult multiple dashboards from different ad networks. Not only is this messy and time-consuming, it can also lead to an error in reporting, as different networks will often report the same metric in slightly different ways. For example, one network might define an impression as the moment the first pixel of the ad shows, while another may measure it only when 51% of the ad has displayed. This will result in minor, yet significant differences in the way eCPMs of each network are calculated. To avoid having to manually standardize KPIs, it’s important that your ad network mediation provider offer an easy-to-use dashboard that not only centralizes reporting, but provides a fair, “apples-to-apples” comparison of your various partners by normalizing the metrics provided by each. In addition, ask your potential partner what kind of controls they offer to manage your demand preferences. For example, Fyber provides the ability to define demand priority rules directly from the dashboard on the serverside, so clients can execute on direct deals by top-ranking a particular network without touching a single line of code. Your account manager is also one of the most valuable tools to growing your revenue: He or she can offer guidance in format and network selection, as well as tips on ad placement, rewards, VC exchange rates, frequency, or pacing. There are many ingredients that contribute to a winning monetization strategy and having an experienced guide is key, so ensure that your ad mediation partner has a demonstrated a track record of success and offers a dedicated team of account managers who are experts in their field.